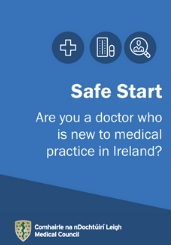 Safe Start - Are you a doctor who is new to medical practice in Ireland? ARE YOU A DOCTOR WHO IS NEW TO MEDICAL PRACTICE IN IRELAND? Engaging in CPD relevant to the themes highlighted on this webpage can be recorded as part of your maintenance of professional competence. This information has been designed to help doctors new to practice or returning to practice in Ireland. It will help you understand the general requirements when practising here and how to deal with some common clinical practice scenarios that may arise. You must have appropriate professional indemnity. You must maintain your professional competence. This means you must enrol in a professional competence scheme and engage in continuing professional development (50 CPD credits and one practice improvement/clinical audit activity per year). You must respect the Guide to Professional Conduct and Ethics for Registered Medical Practitioners. Rights and expectations of patients in the Irish healthcare system. Are your patients always clear about what to expect from their treatment? Do you know how to obtain patient consent in line with guidelines on good medical practice? Do you know the requirements when prescribing medicine for a patient in Ireland? Do you know how to ensure that the treatment, medication or therapy you prescribe for a patient is safe, evidence-based and in the patient’s best interests? How confident do you feel about dealing with emotionally difficult and complex issues associated with End Of Life care? Medical records consist of relevant information learned from or about patients. They include visual and audio recordings and information provided by third parties, such as relatives. How familiar are you with requirements in medical record keeping? Good professional practice is based on a shared understanding between the profession and the public of the principles and values that underpin good care: partnership, practice and performance. Effective doctor-patient communication is a central clinical function in building a patient-practitioner partnership. There are several barriers to effective communication between patients and doctors. These supports provide a confidential and independent service to doctors that may be going through a difficult and stressful time. We encourage doctors to access these supports. It is your responsibility to understand the general requirements when practising in Ireland. The courses listed in this booklet will help you gain this knowledge. The Medical Council's mission is to ensure high standards of education, training and practice among doctors for the benefit of patients. This resource has been designed to assist your integration into the Irish healthcare system. If you have any concerns, please contact us.